I told my friend that I cannot make it on this one Sunday sebab my BIL is getting married. My return to Malaysia in the last summer was not purely for raya.. Some part of it was because, the brother in law is getting married. 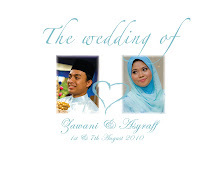 Cut the story short, let`s start with the solemnization. The akad and reception were held in one place, different hall. Therefore, overall all events were for me, done really nicely. If there`s any hiccups, I, as the guest of the day didn`t really seem to notice. For me, it was one perfect solemnization event. I was so happy for both of them. The bride. She had the seri. She was wide smiling all day! Welcome speech by the bride`s atuk with nikah dais as the background. Some of the hantaran for her. Our side chose purple as the theme with pink as additional flavor. All hantaran consist of expensive items >.< !! Meja beradab yang tidak terlepas untuk di tatarias ke tahap awesome! Pengantin berarak masuk. The theme was red and orange. Seriously..I couldn`t fit the whole dais in one screen...Dais was tremendously pretty!! That`s the only picture I got with the pengantin baru. Overall, the majlis was beautiful and nicely planned. Selamat Pengantin Baru to Dr Aizzat and isteri.